Figure 1.2 Conlours of (a) O, volume mixing ratio (ppmvj and (b) contours of O, number density (10" molecules cm ') in December 1992. Data are from the UARS Reference Atmosphere Project (W. J. Randel, personal communication, 1998). remains approximately constant at around 4x 10'2-5 x 10l? molecules cm \ The peak in the VMR rises to higher altitudes as one moves away from the equator, and the magnitude of the peak decreases. O, cm *. For simplicity, column 0-, is almost always expressed in Dobson Units (DU). The Dobson Unit is the height of the O, in the column (in millicentimeters) if compressed to standard temperature (273 K) and pressure (1 atm = 1013 hPa). For example, 1 x 1019 molecules of O, cm 2 would, if compressed to STP, form a volume 1 cm by 1 cm in cross-sectional area and 0.37 cm in height—which is 370 DU. From Figure 1.2b, one can see that most of the (); in the stratosphere is located between 100 and 10 hPa. Because of this, this region has come to be known as the "ozone layer". Only a small fraction of the O, column lies above about 35 km, and about 10% of the O, column resides in the troposphere. There are two reasons why column O, is of interest to researchers. First, it is relatively easy to measure from the ground and from space. As a result, there is an extensive record of column 03 measurements, some of it extending back to the 1930s. Second, as mentioned earlier, the 0-, in the atmosphere screens the biologically dangerous short-wavelength portion of sunlight before it reaches the surface of the Earth. It is the total column of O, that is the most important determinant of how much of the harmful radiation is screened by the atmosphere—with how the O, is distributed in the column being of less importance. Thus, column O, is a crucial quantity in determining how changes in the atmosphere affect the biosphere [4,31. 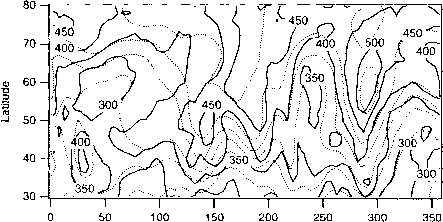 Figure 1.3 Northern hemisphere mid-latitude column O, distribution on March 21, 1992 (black lines). Also shown are geopotential height contours on the 300 hPa surface (dotted lines, no labels) from the UKMO analysis. Column O, values are version 7 TOMS data. 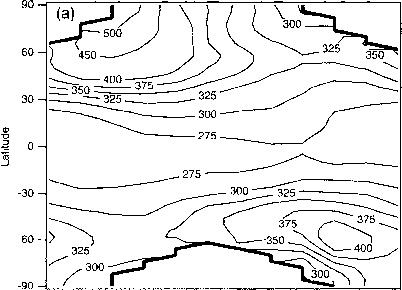 example, column O, ranges from about 275 DU at 50° longitude to about 525 DU at 290° longitude. Also shown on the plot are contours of geopotential height on the 300 hPa surface. Much of the longitudinal variability in column (); is associated with the lifting or lowering of the upper troposphere by tropospheric weather systems. The reasonably close correspondence between the column O, and the passage of weather systems was first noted by Dobson , and will be discussed further in Chapter 5.
column O; distribution are caused by differences in the stratospheric circulation in the two hemispheres. There are several aspects of these plots that might strike the reader as puzzling. First, as we will discuss in Chapter 3, O, is produced by sunlight. Because the equatorial region receives considerably more sunlight than the poles, one might expect to find higher column O, over the equator. This is not the case—instead, the regions of high O, abundance do not correlate with the regions of high O,, production. The region with the highest production rate (the tropics) actually contains the lowest column O, abundances. Second, the high-latitude column O, maximum occurs in the late winter and early spring, after these regions have experienced several months of total or near-total darkness. Again, this seems inconsistent with the fact that O, is formed by sunlight. 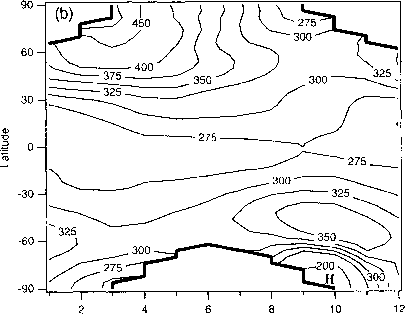 Figure 1.4 Contours of zonally and monthly averaged column O, (DU) in (a) 1979 and (b) 1989. Tick marks represent the middle of the month. The "H" symbol located in October at high southern latitude in 1989 marks the location of the ozone hole. Column O, values are version 7 TOMS data. TOMS requires sunlight for its measurements; the heavy solid line marks the region where total darkness prevents data from being obtained. produced near the equator. However, poleward transport moves this O, to higher latitudes. The magnitude of the transport has a seasonal cycle which is a primary contributor to the seasonal cycle in mid- and high-latitude column O,. The rate of transport is largest in the winter, and this leads to the build-up of Ot during the darkness of high-latitude winter. We discuss stratospheric transport of O, in Chapter 5. An aside: can you breath in the stratosphere? Imagine that you are designing a high-speed supersonic passenger aircraft to fly in the stratosphere at, say, 25 km. You might think that, to save weight, you would not carry oxygen for the passengers to breath, but will instead compress stratospheric air up to 1000 hPa and fill the cabin with that. Is this a good idea? Probably not. First, air compressed adiabatically to 1000 hPa would have a temperature equal to its potential temperature. Air at 25 km has a potential temperature of about 600 K, so you would need to cool this air after compression but before it was sent into the cabin—otherwise, the passengers would cook. Second, it is generally believed that breathing high levels of O, can be harmful to human health. Values of O, of over 100-150 ppbv are generally considered unhealthy and to be avoided. In the stratosphere, O, abundances of ~4-7 ppmv, or about 50 times greater than the unhealthy level, are typical. Obviously, you would need to scrub this O, out of the air before it is sent into the cabin—otherwise you would poison the passengers. And O-, is not the only toxic constituent in the stratosphere: there are several others that would have to be removed prior to breathing the air. From this it is clear that the stratosphere is a surprisingly toxic place, and you would not want to breath it without treating the air to make it more hospitable. Over the past few decades, the abundance of stratospheric O, has been declining. Depending on the timing, magnitude, and location of the O, decline, the decrease of stratospheric O, is traditionally divided into several different scientific problems. We will discuss these now. 1.3.1 The Antarctic "ozone hole"
One of the most important events in atmospheric science was the publication by Farman et al. f 12] of measurements of column Q ; taken over Antarctica between the late 1950s and mid-1980s. Their data showed that the spring values of column O . in the mid-1980s were 50% lower than column 03 measurements taken in the 1960s. Further research showed the dramatic evolution of what has come to be known as the Antarctic "ozone hole". 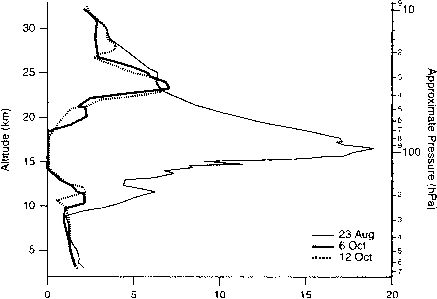 The Antarctic O, profile in late August 1993 looks normal (Figure 1.5), with a column abundance of 287 DU. By mid-October, however, virtually all of the 0_, between 14 and 19 km altitude has been destroyed, reducing the column to below 100 DU. The area of the ozone hole (as defined by the 220 DU contour) in 1992 and 1993 was about 25 x 10" km' (see WMO [131, Figure 1.28), or about 10% of the southern hemisphere. The ozone hole can also be seen in Figure 1,4b in October. 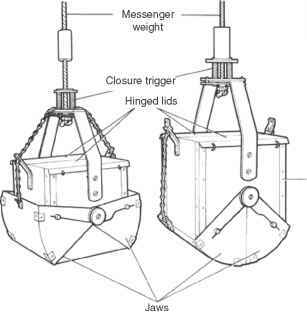 Figure 1.5 O, profiles measured in the Antarctic vortex by balloon sondes in 1993 [14j. O abundance is expressed in partial pressure (mPa); dividing by the pressure yields the VMR (e.g. 20 mPa at 100 hPa is 2 ppmv). little of the column's O, is located in the upper stratosphere, trends in column O, would only become observable sometime in the twenty-first century. The unexpected observation of significant loss of O, in the lower stratosphere, where the majority of the 0-, column resides, meant that something scientifically interesting as well as potentially disastrous was occurring. The Antarctic ozone hole is now one of the most thoroughly studied and well-understood phenomena in the atmosphere. It turns out that the unique meteorological properties of the southern hemisphere polar region, in particular the low temperatures, combined with part per billion concentrations of anthropogenic chlorine lead to unique polar chemistry that results in rapid destruction of O,. It should be noted that this polar chemistry also occurs in the Arctic, but, owing to differences in the meteorology of the hemispheres, less O, loss occurs in the Arctic. This topic is discussed in detail in Chapter 7. The Antarctic ozone hole is a dramatic and disturbing event, but its remote location renders it effectively irrelevant to much of the world's population, most of whom live at northern mid-latitudes. Of great concern to this majority, however, is the realization that O, is also decreasing al mid-latitudes in both hemispheres. Figure 1.4a shows the annual cycle of column O, in 1979. A comparison with Figure 1.4b, the annual cycle of column O, in 1989, shows definite differences. In general, the mid-and high-latitude column O-, is about 5% lower in 1989 than it is in 1979. At low latitudes, there is little or no difference in column O,. It is important to not infer too much from the comparison between Figures 1.4a and 1,4b. First, when comparing atmospheric measurements, one must take care not to interpret random variability as a trend. We have not provided any evidence to show that the differences in these column O, maps could not result from year-to-year variability. Second, one must consider other factors, such as the solar cycle or periodic meteorological phenomenon such as the quasi-biennial oscillation (QBO). The observed differences between 1979 and 1989 column O, abundances might not be a trend but part of a repeating cycle. To identify trends in the data, researchers process the time series of column O, data using statistical models that remove all of the known sources of cyclical variability (e.g. solar cycle, annual cycle, quasibiennial oscillation) as well as random variability [16,17]. Changes in O, that remain are attributed to chemical destruction by anthropogenic trace gases. Figure 1.6 shows the latitudinal distribution of the column O, trend determined from such a model. It shows, in agreement with our eyeball estimate, that column O, has decreased by 3-9% per decade at mid-and high latitudes, with little change at low latitudes. The large erosion of column O, at high southern latitudes is attributed to the growth of the ozone hole during this period.